My friend Fr. Ivan Tou, CSP, is a very interesting person. One interesting thing he does is that he does not age. No one really knows how old Ivan is because he looks the same as he did twenty years ago. Another interesting thing Ivan does is write wonderful, chatty Christmas letters that are part litany-of-people-and-places-he’s-visited-in-the-past-year (this is where you find out that he has about 28 godchildren), part analysis-of-movies-he’s-seen (which I skim over when he gets too sci-fi), and part wisdom-gained-in-the-past-year. Several years ago, Ivan shared some Christmas letter wisdom that has stayed with me. He described how, in his parish work, he is keenly aware that so much of what he does is bound to be undone as soon as he leaves a parish. A statue he purchased may be removed. A garden he planted may be made into a parking lot. A new ministry he initiated may fizzle out. And so on. This could become quite discouraging over time, to feel that one’s work doesn’t last. But Ivan said there is one thing that doesn’t change, one thing that can’t be taken away, one legacy far superior to improvements to property or even ministries—and that is people. Love between people—relationships, friendships. Ivan said that over the years, this is what he holds onto—the people he has met and loved, and those who have loved him. Of course, people and friendships can change too. But what does not change is the impact they’ve had on us, the memories we make, the wisdom we’ve shared, the meals around a table that enriched us, the time and the effort and the goodness of people. This is what the Church is made of, after all. People, relationships, love. This is what matters. This is what lasts. After I wrote this, I found Fr. Ivan’s Christmas letter from 2016. Here is the paragraph I remember! One thing I’m constantly relearning is nothing lasts. All the great software I wrote for HP has been erased and the back-up drives probably live in some landfill. The great ideas I started at my previous parish are no doubt forgotten as the replacement pastor and new parish staff invent their own ideas. And the things I’m doing at Berkeley will probably fade away when I move on, though Fr. George, a pastor here in the 80’s, reminds me that the current red carpet and patio gates are his doing. What seems to matter is the journey and the relationships we make along the way. People last forever, everything else has their time and then fades away. So a meaningful life seems to be connected to touching people and touching them deeply, or as Jesus taught us, love God and love neighbor with your everything. Thank you, Fr. Ivan Tou. Come see us in Connecticut! Okay, maybe we’ve all changed just a little bit. Ivan, Amy, Ono. 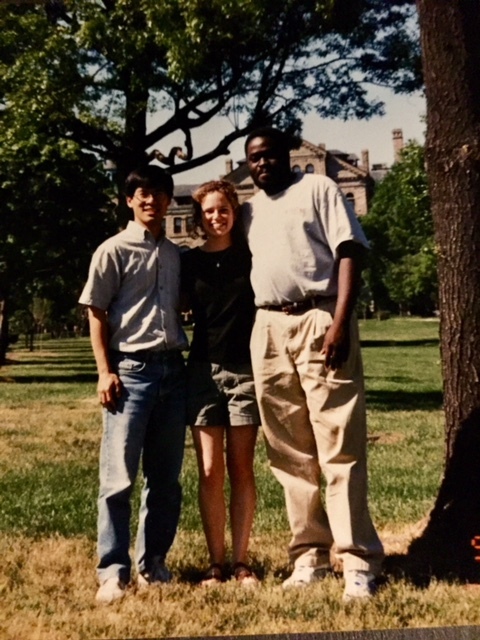 CUA 1999. People last forever. This week I’m re-posting one of my first and favorite blog posts. It’s been off my site for several years as I wanted to make a few edits, and then I just never got around to re-posting it. Some of you may have read it in That Mighty Heart. My first ministry position was as a parish DRE in Clinton, Maryland. I was 23 when I started, and I honestly had no idea what I was doing. This essay is about my office at the parish, which I inherited from the matchless Sister Blanche Twigg, MHSH. The bookcases of Sr. Blanche’s office were lined with Little Rock Scripture Studies and Catechist Magazines, two publications I never dreamed that I would someday write for. What a beginning I had there, with co-workers who mentored me and parishioners who accepted me. What a place that was to be, sitting at Sr. Blanche’s desk! I will never forget my first “real” job interview. Fresh out of graduate school, I was applying for a parish position as a Director of Religious Education. I was 23 years old. The interview was by all accounts fairly average until I asked the pastor why the former D.R.E. left the position. He looked happy and sad, amused and wistful, all at the same time. “Sister Blanche served here for 25 years,” he told me. “She was 82 years old. She has gone to be with the Lord.” Later I would discover that Fr. Tom’s emotion was the result of a long and solid friendship with this formidable religious sister. Twenty years his elder, she called him “Tom” in a mother’s tone and ran the show as she liked. And she liked a tight ship. In the coming months, I would hear many legends about Sr. Blanche – how every morning she “pointed” her car in the direction of the parish and drove to work; how no one could say no to her; how children obeyed her and parents feared her; how she was a force to be reckoned with; how much they loved her. Sr. Blanche was a gifted educator, a respected Scripture scholar, a master recruiter, a thrifty manager, a green thumb, a tough cookie, a trusted friend, a spiritual guide, a miracle worker. My first day on the job, I walked into Sr. Blanche’s office. Her plants had been cared for, her books arranged neatly. I sat down at Sr. Blanche’s desk. It felt large and unfamiliar. Unsure what to do next, I opened the top drawer. I looked at all the things Sr. Blanche had left behind – things she had used so many times, things she kept at the ready. Who was I to clean out this desk? With whispered apologies to my predecessor, I began to pick up the items inside, one by one, trash can at the ready. But I couldn’t throw away much more than a few brittle rubber bands. Many of the items were unidentifiable or just really old. In her eyes, they might have a use someday. Who was I to decide they wouldn’t? This was my first encounter with Sr. Blanche. And in my own way, I encountered her many more times in the coming years. I was the opposite of this great lady – I was young, I was new, and it became obvious rather quickly that no one feared me. I needed her, I leaned on her in some inexpressible way. Her influence mentored me. Her legend challenged me. And all the while, those strange things in the top drawer comforted me – old things waiting to have some new use. I never tried to be Sr. Blanche. It would have been utterly futile. But I took care of her plants, I read some of her old books. I tried to care for her people, and sit earnestly in her chair, and make her proud in my own small ways. And in the years I occupied that desk, I happily left the top drawer just as it was. It contained treasures I did not yet understand. As I look back on that time, I like to imagine that together, Sr. Blanche and I were like the scribe training for the kingdom, like householders bringing out of our treasuries what is new and what is old (Matt. 13:52). Sr. Blanche Twigg (1917-1999) joined the Mission Helpers of the Sacred Heart in 1936 and served as the Director of Religious Education at St. John the Evangelist Parish in Clinton, Maryland from 1974-1999. Among other things, she was known for her thriftiness and her love of Scripture. Anyone who has worked in a Catholic parish knows what to expect on and around Ash Wednesday: telephone calls at all hours, strangers randomly showing up for ashes, folks leaving after receiving their ashes but before receiving the Eucharist. Among the “regulars,” there’s a lot of eye-rolling and head-shaking, and an overwhelming desire to figure out why, on this day, getting ashes is the single-minded compulsion of every Catholic on the planet. But what if this yearly “ash mania” isn’t just a mindless impulse? What if there is something deep and sacred behind it? Could it be that what drives even non-practicing Catholics to participate in this yearly ritual is that deep down it captures the essence of their Catholic faith and what they love about it? Could it be that this day of fasting and abstinence, this solemn inauguration of the Lenten season, has also become a day to celebrate our Catholic roots? It seems that if we could get to the bottom of the compulsion to “get ashes,” we might find what people are really looking for, what drives and excites them, what is at the heart of the faith for many of our brothers and sisters. So here are just a few ideas about why we Catholics love our ashes. That smudge of ashes marks us as belonging to a group, a very special group, and it simply feels good to belong. This is not an exclusive group by any means; it is not a “secret club” or an elite members-only organization. It is an ancient conglomeration of all types. On Ash Wednesday, it is edifying to look around and see all those types. Our communal, dirty foreheads are a gentle way that we remind the world who we are. And we find that it feels good to be counter-cultural, together. Sin and Death are Real. Catholics used to be accused of dwelling too much on sin (“Catholic guilt”) and death (“Why the crucifix? Don’t you know he’s risen?”). We’ve lightened up a bit, but we do still insist on reality: we are sinners, we do suffer, and we will die. On Ash Wednesday, we wear a visible sign of these realities – ashes symbolize both our sorrow for sin (“Repent, and believe in the Gospel”) and the recognition of our own mortality (“Remember that you are dust, and to dust you shall return”). These might seem like depressing realities – why would we want to spend a day with sin and death on our foreheads? Because we know that the first step in diagnosing and remedying these conditions is to reveal and identify them. To hide them or never talk about them would be like hiding symptoms from our doctors and never being cured. If I am a sinner, I need a savior. If I am going to die, I need a miracle. Our faith offers us both. We do not proclaim our sinfulness for the sake of a guilty conscience, or our mortality for the sake of feeling sad. Rather we proclaim them so we might share in the antidote; we proclaim them for the sake of the savior and the miracle he can work in our lives. With this sign we proclaim the wise words of Christ: “Those who are well have no need of a physician, but those who are sick” (Lk. 5:31). The Power of Touch. Allowing another person to mark us with the sign of ashes is a very personal thing. We are inviting someone else into our “personal space” and allowing them to mark us with a sign that makes us visibly vulnerable. Just as when we have our feet washed or share in a sincere sign of peace, we are momentarily bonded with the person opposite us, the person who draws near and touches us with sacred purpose. Although we are being marked with a sign of sin and death, the touch we receive is healing. It is a human touch that represents the healing ministry of Christ and his Church. Catholics are born into or later embrace this sacramental perspective. We see and experience deeper realities in our physical world – bread and wine become the Body and Blood of Christ, water becomes a transforming wash. In this very Catholic way of looking at things, we don’t just get a smudge of ash from a stranger and go on with our lives. No, we stand before one who is both a fellow sinner and a mediator between human and divine realities; we allow ourselves to receive the healing touch of one who is also marked with ash, who also needs a savior, whose way of marking us somehow communicates understanding, hope, and the redemption we desire. The human touch that marks us with ashes is an experience of both human and divine love. Who wouldn’t show up for that? Now perhaps this reason is not as deep or noble as the others, but it does touch on a natural human desire to participate in our own spiritual formation and growth. We instinctively know that although we are utterly dependent on the grace and mercy of God, there are some things we can and should do to foster our participation in that grace and mercy. Sitting at home watching television does not generally bring us closer to Christ. 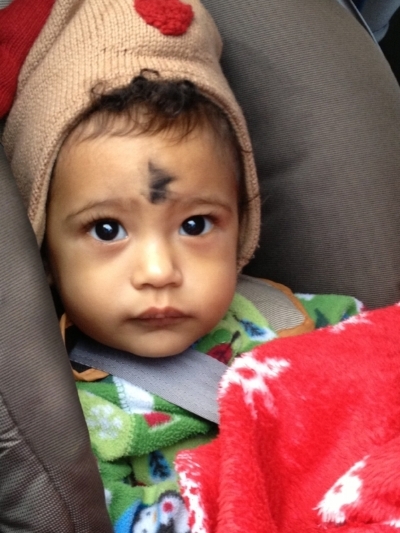 Perhaps Ash Wednesday serves as a wake-up call in terms of our priorities. How to keep that call coming every day is a much more challenging task. Being Part of Something Ancient. There is something ancient about ashes. Even though the ashes we receive may be “fresh,” the symbolism goes way, way back. From ancient times, ashes have symbolized mourning and penance. We occasionally come across colorful old accounts in Scripture of prophets or penitents covering themselves in “sackcloth and ashes” (Esther 4:3; Job 42:6). Even those who receive ashes without knowing this background at least know that it is a very old Catholic custom. In a Church that has “updated” in many ways in the past fifty years, our ashes remain the same. We are connected with years and centuries past in a ritual that calls us back even as it prods us forward. This is Catholicism at its best, embracing and inviting others to participate in a beauty “ever ancient, ever new" (St. Augustine, Confessions). Almost a Year’s Worth of Spiritual Connections. The fact that the ashes applied to our heads on Ash Wednesday come from the palms of the previous year’s Palm Sunday (though admittedly some parishes have now dropped this tradition and purchase their ashes from a supply catalog!) adds another layer of symbolism to the ash ritual. Even if we are not thinking about this symbolism as we go to receive our ashes, it still lies somewhere in the back of our minds, part of that collective Catholic consciousness. On Palm Sunday of the previous Lent, we waved those palms in joyful welcome, in jubilant recognition of the entry of Christ into Jerusalem. We waved them in celebration, but also with the weight of knowing what would happen in Jerusalem, and knowing how we, the crowds, would turn on him. Those palms went home with us as reminders of the joy and sorrow of Holy Week, of the mission of Christ who suffered for us, and of our own role in that suffering. And now, on Ash Wednesday, the palms have returned, they have been burned, and their ashes are applied to our own bodies as another sign – a continuing sign of the joy and sorrow of the penitent. In these ashes we have almost a year’s worth of spiritual connections – from Palm Sunday to Ash Wednesday, from Lent past to Lent present. The Beauty of a Simple Ritual. We may as well admit that as much as Catholics love a good liturgy, we also like to know when things will start and finish (Sunday Mass is one hour, weekday Mass is half an hour, the rosary is a quarter of an hour), and we truly appreciate the occasional brief ritual. I’ll admit short confession lines and brief homilies are a few of my favorite things. I remember one year our family had been hit with some kind of virus, and on Ash Wednesday we were struggling to recover. We had read in the parish bulletin that ashes would be out in the church for those who could not attend a service. We stopped by, curious and a bit sheepish. Inside, a few people were praying, and it was very quiet. Several crystal dishes containing ashes were on a table at the front of the church, with brief instructions about what to say and how to apply the ashes. As we marked one another’s foreheads, it did feel unusual. But the moment was also profound in its simplicity, and the familiar words, as we said them to each another, sounded different. They sank into my mind in a new way. That year, the ritual was uncommonly brief, but it still hit home. While I’m not advocating this experience as the norm, sometimes a simple ritual has surprising impact – without time for our minds to wander or grow complacent, its power has a fighting chance to change us. Why We Love Our Catholic Faith. Maybe at the heart of this list, we find not only what we love about ashes and what we love about Lent, but what we love about Catholicism itself: a strong identity that creates a sense of belonging, the power of the Cross and the touch of a mediator, a realistic sense of sin and death, an awareness that we have to work hard right along with God’s transforming grace, the holiness of old things, the connectedness of all truths, and sometimes, that good-old-fashioned Catholic satisfaction in following the because-it’s-good-for-you rules handed down by our beloved Church. So if you work at a parish and you don’t think you can take one more phone call, or if you see your neighbors “ashed up” but you never even knew they were Catholic, or if the person in the pew next to you heads for the door before the Eucharistic Prayer, try to call to mind the power of ashes. On this day, we share a bond, a visible bond. On this day, we are so very proud to be Catholic. This piece was originally published in St. Anthony Messenger magazine, February 2016.